"The NAMA SPV structure has a subscribed capital of €100m. As explained to the Dail at the time of the legislation, and subsequently agreed with the EU, 49% of this capital was advanced by NAMA and 51% by private investors. "In line with my statement to the House on 30 March on the banking situation, I subsequently issued Promissory Notes on 31 March to Anglo Irish Bank and Irish Nationwide Building Society. These Notes will ensure that both institutions continue to meet their regulatory capital requirements. 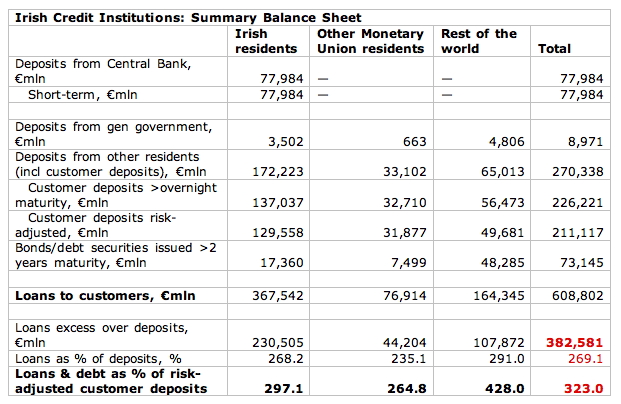 The initial principal amount of the Note that issued to Anglo Irish Bank is €8.3bn and to INBS it is €2.6bn. As I indicated in my recent statement, it is likely that Anglo will need further capital in due course but the extent and timing of such further support remains to be determined. We are once again swamped with the 'new numbers' from the DofF and Minister Lenihan. This time the latest 'facts' relate to the potential cost of shutting down Anglo. Yesterday, Mary Coughlan stated in the Dail that the cost of an immediate liquidation of the bank had been prohibitive (per Irish times - here). Today, the unquestioning media squad is reporting that the cost of shutting down Anglo will be "more than €100 billion" (The Irish Independent, page 17). This figure has been floated out by the Anglo's paid-public-'experts'-turn-paid-executives, like Mr Dukes, and by the DofF talk-heads. Risk-adjusting loans to customers to reflect an impairment charge of 60% implies recoverable loans of €26 billion (without a need to call in Nama at all). Total recoverable assets of €34 billion. Thus, the real taxpayers' liability is €60bn-€34bn=€26 billion. Not €70 billion, nor €100 billion claimed by the various parties. "What about bond holders?" Ok, there are €15 billion worth of senior bond holders and €2.3 billion of subordinated bond holders. These bondholders - all institutional - have been begging the State for years to keep banking sector lightly regulated. And I agree with them on this, in principle (omitting details here). As a part of their pleas, we've been repeatedly told that markets are able to price risks better than any regulator can. And I agree with them on this as well. So, as a consequence of their own stated desires and claimed powers, the bond holders should be made to bear the responsibility for their own errors in pricing risks. In other words, the Government should tell them to count their losses. This is what the market is all about and this, not the rescue by taxpayers, is what the real market participants expect from Ireland Inc. Lastly, on this point, there is not a single financial instrument or contract that legally requires the Irish taxpayers to foot the bill for non-sovereign investment undertaking. Full stop. Cut the guarantee on all Anglo bondholders and send them packing. Note: even if we are to cover bondholders in full, Anglo wind down will cost no more than €39 billion. Not €70 billion, nor €100 billion. "How can the winding down take place?" Simple - we proceed to gradually, over the next 5 years, to sell assets. Depositors remain guaranteed, so we can rest assured they will not call in their deposits all at the same time. As we realize the value of the assets, we gradually close off the liabilities. To do this, bank staff can be reduced by over 50% and their wages (currently averaging €110,515 per annum per employee) can be cut by the same proportion. This is it, folks - simple. Why are Messrs Dukes, Lenihan etc are claiming that the winding down Anglo will cost €70-100 billion? Is it because (a) they have no idea and are 'inventing' numbers as they go? or (b) they have an ulterior motive to claim improbably high figures to continue dragging out this Anglo saga over 20 years? Why have the Irish taxpayers paid hundreds of thousands of euros to 'consultants' who cannot come up with a simple, straight forward plan for dealing with Anglo to date, despite the fact that people like Peter Mathews (to whom I am obliged for much of the figures quoted above), Brian Lucey, Karl Whelan and myself have provided viable alternatives for dealing with the 'bank' free of charge? Back in October last year I did an estimate, based on the IMF model, of the peak-to-peak duration of the current housing slump. Now's time to do some updating on this matter. Growth rates - resuming in 2011: 2011-2013 +3.6% - in excess of the long-term growth rate estimate for Ireland in the current GFSR (2.6%), slowing to 3% in 2014-2016, then to 2.7% in 2017-2019 and 2.6% thereafter. Using peak of Q2 2007 to assumed trough in Q3 2010, we have the full cycle duration of between 95 and 87 quarters, taking us back to 2007 peak by either 2029 or 2031. If bottom hits at -48%, we get return to 2007 peak by 2034, with 107 quarters from peak to peak cycle. Now, think Nama will run out in 2015? or 2020? If Nama sets shut-off date in 2015, it is likely to get between 61 and 70 cents on the euro for each value underlying the loan. Assuming loans LTV of 70% and default rate of 30% on loans transferred to Nama (extremely conservative assumptions, but these allow a cushion on some interest collected), the value of Nama realized book will be 26 cents on the euro and 30 cents on the euro, or less than 50% of the post-discounted price paid! If Nama shuts down in 2020, the above two figures will be 30 cents and 34 cents on the euro paid or just around 50% of the post-discounted price paid! Now, that's what I would call overpaying for the loans. Another credit downgrade from S&P, this time for Spain, from AA+ to AA with negative outlook, based on the outlook for years of private sector deleveraging and low growth. 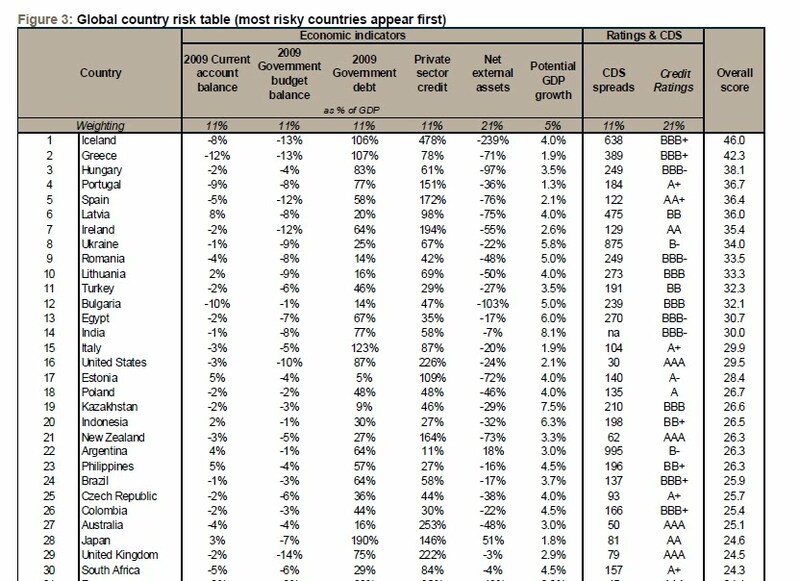 Spain, as you can see, is severely in red in terms of debt, ranking 14th in the world. Spain's external liabilities stand at 186.1% or $2.55 trillion (as of 2009 Q3) against estimated 2009 GDP of $1.37 trillion. The country is actually worse off in terms of debt than Greece which has ranks 16th at debt at 170.5% of GDP or $581.68 billion, with 2009 GDP of $341 billion. 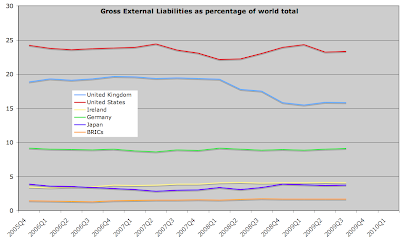 Of course, Ireland is world's number 1 debtor nation with external debt of 1,312% of GDP (IFSC-inclusive) of $2.32 trillion in Q3 2009 against the GDP of $176.9 billion. Of course, part of this debt is IFSC, but then, again, we really do not have a claim on our GDP either, with GNP being a more real measure of our income. 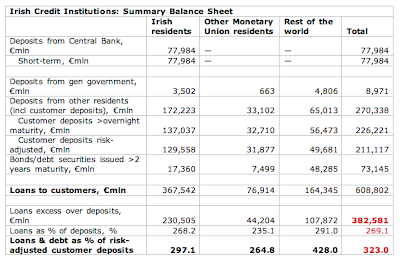 So on the net, our debts - the actual Irish economy's debts - are somewhere in the neighborhood of 740%. This is still leagues above the UK - the second most indebted nation in the world - which has the debt to GDP ratio of 'only' 426%! The S&P also provided estimate for expected recovery rate on Greek bonds, which the agency put at 30-50%. In other words, S&P expects investors in Greek bonds to be paid no more than 30-50 cents on the euro. Yesterday on twitter I suggested that "Greek debt should be renegotiated @ 50cents on the euro - severe default. Portugal's @ 80 cents - mild default, Irish @ 70-75 cents". Looks like someone (S&P) agrees. Before it is too late, before German and other European taxpayers have poured hundreds of billions of euro into the PIIGS black hole of delinquent public finances, Europe should cut losses and force Greece and Portugal to renegotiate their liabilities. If Ireland and Spain were to elect to follow, so be it. Of course, in Irish case, the debt re-negotiations should cover private debts, not public debt. Just how many billions of euros are EU taxpayers in for for the folly of admitting Greece - a country that spent 90 years of the last 180 (since 1829) in defaults on its debts - into the common currency area? Well, Greek 2-year bonds were traded at yields of 26% yesterday at one point in time. This is pricing that's in excess of pretty much every developing country, save for basket cases which practically cannot issue bonds at all. The loans to Greece will be subordinated to existent bondholders, which means that if in the end Greece does pay 30-50 cents on the euro to the latter, European taxpayers will be lucky to get 10 cents on the euro. The whole deal is now looking like a massive subsidy for Greece and entails absolutely no protection to European taxpayers. to the absolutely outlandish HIPCI and HIPCII agendas wholeheartedly embraced by the EU, which were supposed to deliver debt relief to the world's real basket cases (before Greece and other PIIGS took the spotlight away from them), and the rest of the international white elephants. The problem, of course, is that €600 billion price tag for fiscal excesses has generated preciously little in returns (despite what folks at Tasc keep telling us about the fiscal stimulus) which means we will have to pay for it out of our long term wealth. The same wealth that has been demolished by the recession and the financial markets collapse! May Toyota forgive me a pun, but is this a stuck (downward) accelerator problem?.. After all the 'right things' done to our economy, why are we still leagues away from even our fellow PIIGS travelers? Makes an implicit claim that the spectacular collapse of Greek economy witnessed by the entire world and threatening contagion to all of the EU has been caused by Greece not running enough deficits! And concludes that: "By contrast, other EU countries adopted fiscal stimulus measures [without identifying which states did so, what were the implications of these, etc]. Their debt has stabilised along with economic activity [a mad claim, given that stimulus measures were financed out of debt increases] and they have been rewarded with much lower bond yields than Ireland [absolute groundless claim, as none of the countries that adopted stimulus had the same fundamentals as Ireland going into the recession or during the recession and furthermore, none of the countries, other than PIIGS experienced similar bond yields dynamics to Ireland]"
I mean this stuff is actually factually incorrect and logically inconsistent! So will Germany open a 'needle exchange' for Europe's debt junkies (para-phrasing Laughinbear comment)? Check CNBC's rankings of debt by nation (here - all rankings slide show)... Greece is No 16, Ireland is No1! Link here. 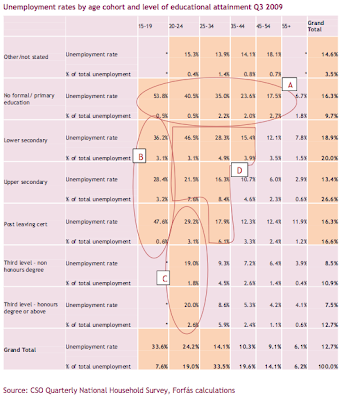 Economics 27/04/2010: Greece - the end is tragic! This is it, folks. No where else to run. Greek interest on public debt would swallow over 19 percent of their GDP annually! Now, spot the similarity in responses to the crisis in Greece (here) and Ireland (here) and tell me - are we really that much better off in terms of macro fundamentals than Greece, especially given that Greek policymakers are at the very least not held hostage to a Social Partnership in which the likes of Tasc-informed Unions have a direct say? Bank of Ireland deal: per latest report from the RTE, the State's shareholding in BofI will increase to 36% from 16% through a conversion of €1.7bn of funds given to the bank last year into ordinary shares. The bank will now attempt to raise the other €1.7bn in equity from private markets with a rumored discount on first-offer of 40%. This is another extraordinary statement made by the Minister. The Minister has just informed the nation that we are overpaying some 11%+ (see below) for the shares gained under this conversion, since 'the transaction has been agreed on market terms'. Aside: the Minister does not appear to clearly understand the terms of conversion he agree to, as 'market terms' would mean that the state is converting at a current price (Friday close of €1.80) less cumulated dividends (2 years @8%), less the discount extended to the market (38-42%). 'Market terms' therefore would imply conversion at €0.88 per share, not €1 per share achieved. Finally, the Minister failed to negotiate a discount that should be due any large-scale investor. All in, the estimated overpayment of 11% is really a likely underestimate. In exchange for our money, we, the taxpayers, got a pile of over-priced shares which are about to be diluted! Looking closer at the details: BofI plans to raise €500mln from private placements with institutionals, priced at €1.53 or 15% discount on Friday close price. The main issue will be €1.2bn (net) with 38-42% discount. Preference shares held by the taxpayers will be converted at €1 per share (they were bought at €1.2 per share and paid no dividend), which actually means we de facto are paying €1.16 per share, while existing shareholders can get shares at as low as €1.04-1.06. Government-held warrants are priced at ca €491mln. Name and shame, folks. 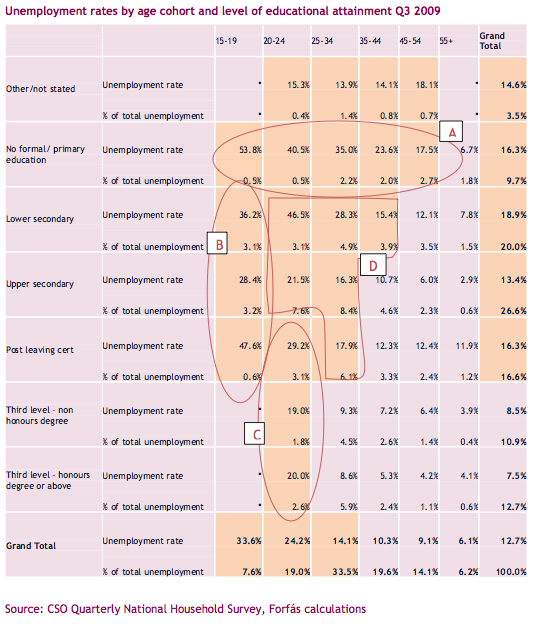 The table below is reproduced from Forfas' "Profile of employment and unemployment" publication from February 2010. The research paper itself is not really worth covering in any depth, as it contains broadly speaking nothing new. But the table below is worth one's attention. Irony has, it is sourced as "CSO Quarterly National Household Survey, Forfás calculations". One can really see the quality of 'calculations' deployed from the sophisticated mathematical Scribbling Model developed by the 3-year olds in a Montessori University and adopted by Forfas research staff. Superb! “It’s been a brilliant day,” said a friend of mine who manages a large investment fund, as we sat down for a lunch in a leafy suburb of Dublin. “We’ve been exiting Greece’s credit default swaps all morning long.” Having spent a couple of months strategically buying default insurance on Greek bonds, known as CDS contracts, his fund booked extraordinary profits. This wasn’t luck. Instead, he took an informed bet against Greece, and won. You see, in finance, as in life, that which can’t go on, usually doesn’t: last morning, around 9 am Greek Government has finally thrown in the towel and called in the IMF. As a precursor to this extraordinary collapse of one of the eurozone’s members, Greece has spent the last ten years amassing a gargantuan pile of public debt. Ever since 1988, successive Greek governments paid for their domestic investment and spending out of borrowed cash. Just as Ireland, over the last 22 years, Greece has never managed to achieve a single year when its Government structural balance – the long-term measure of public finances sustainability – were in the black. Finally, having engaged in a series of cover-ups designed to conceal the true extent of the problem, the Greek economy has reached the point of insolvency. As of today, Greece is borrowing some 13.6% of its domestic output to pay for day-to-day running of the state. The country debt levels are now in excess of 115%. Despite the promise from Brussels that the EU will stand by Greece, last night Greek bonds were trading at the levels above those of Kenya and Colombia. Hence, no one was surprised when on Friday morning the country asked the IMF and the EU to provide it with a loan to the tune of €45 billion. This news is not good for the Irish taxpayers. Firstly, despite the EU/IMF rescue funds, Greece, and with it the Euro zone, is not out of the woods. The entire package of €45 billion, promised to Greece earlier this month is not enough to alleviate longer term pressures on its Government. Absent a miracle, the country will need at least €80-90 billion in assisted financing in 2010-2012. The IMF cannot provide more than €15 billion that it already pledged, since IMF funds are restricted by the balances held by Greece with the Fund. The EU is unlikely to underwrite any additional money, as over 70% of German voters are now opposing bailing out Greece in the first instance. All of which means the financial markets are unlikely to ease their pressure on Greece and its second sickest Euroarea cousin, Portugal. Guess who’s the third one in line? 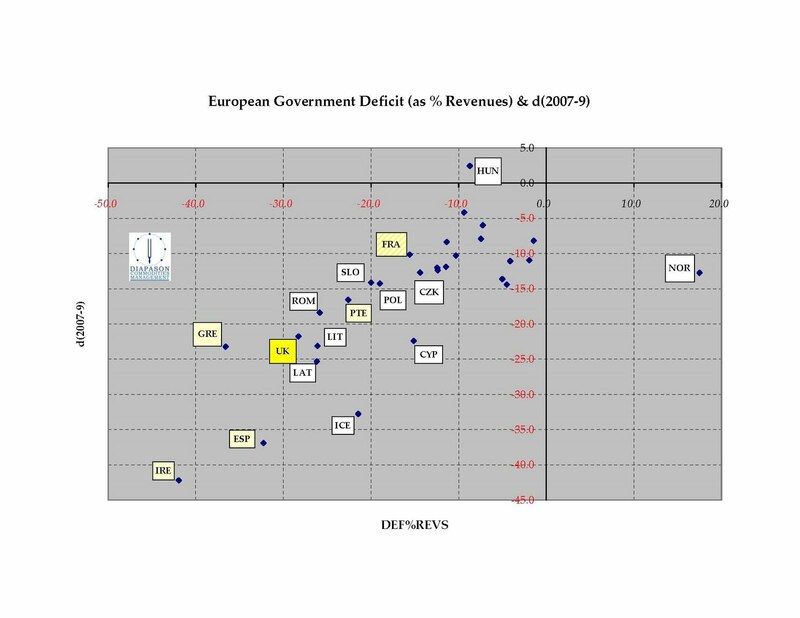 Ireland’s General Government deficit for 2009, as revised this week by the Eurostat, stands at 14.3% - above that of Greece and well above that of Portugal. More worryingly, Eurostat revision opened the door for the 2010 planned banks recapitalizations to be counted as deficit. If this comes to pass, our official deficit will be over 14% of GDP this year, again. All of this means we can expect the cost of our borrowing to go up dramatically. Given that the Irish Government is engaging in an extreme degree of deficit financing, Irish taxpayers can end up paying billions more annually in additional interest charges. Adding up the total expected deficits between today and 2014, the taxpayers can end up owing an extra €1.14 billion in higher interest payments on our deficits. Adding the increased costs of Nama bonds pushes this figure to over €2.5 billion. Three years worth of income tax levies imposed by the Government in the Supplementary Budget 2009 will go up in smoke. Second, the worst case scenario – the collapse of the Eurozone still looms large despite the Greeks request for IMF assistance. In this case, Irish economy is likely to suffer an irreparable damage. Restoration of the Irish punt would see us either wiping out our exports or burying our private economy under an even greater mountain of debt, depending on which currency valuation path we take. Either way, without having control over our exit from the euro, we will find ourselves between the rock and the hard place. Third, regardless of whatever happens with Greece in the next few months, Irish taxpayers can kiss goodby the €500 million our Government committed to the EU rescue fund for Greece. Forget the insanity of Ireland borrowing these funds at ca 4.6% to lend to Greece at ‘close to 5%’. With bonds issuance fees, the prospect of rising interest rates and the effect this borrowing has on our deficit, the deal signed by Brian Cowen on March 26th was never expected to break even for the taxpayers. In reality, the likelihood of Greece repaying back this cash is virtually nil. Which brings us back to our own problems. What Greek saga has clearly demonstrated is that no matter how severe the crisis might get, one cannot count on the EU’s Rich Auntie Germany to race to our rescue. We have to get our own house in order. Unions – take notice – more deficit financing risks making Ireland a client of the IMF, because in finance, as in life, what can’t go on, usually doesn’t. Sometimes, it is wise for policymakers not to speak to the media. This is usually true when the policymakers have no idea what they are talking about. Case in point – FT’s story (here) about the Finnish PM backing German plan for a new treaty on tougher fiscal deficit and debt measures for the Euro area. “Finland is sympathetic to controversial German proposals for a fresh European Union treaty if necessary to enforce fiscal and economic discipline in the eurozone after the Greek debt crisis.” Mr Vanhanen, PM of Finland, said “the priority should be to look for ways to tighten rules within the existing treaty, including the withdrawal of EU structural funds from countries that ignore official warnings from Brussels over excessive budget deficits”. Per FT, “his comments came amid the most serious crisis in the euro’s 11-year history, with Greece on the brink of a bail-out from the IMF and fellow eurozone countries. “Greek debt is not so big but there is a domino threat so we need to isolate the problem as early as possible,” said Mr Vanhanen” (italics are mine, of course). Oops! Did he really say that? At 117% of GDP at the end of 2009, and pushing toward 130% by the end of this year, Greek debt is ‘REALLY BIG’, folks. This is precisely why Greek bonds are trading now at the yields close to those of junk-rated Pakistan! So hold on, Mr Vanhanen. You say that these countries are undertaking reforms only in order to comply with the euro entry rules, not because these are the right things to do? What hope do we, the Eurozone taxpayers, have that once admitted into the club these countries will not turn Greek? None, certainly, judging by Mr Vanhanen remark. My humble advice – if you are a politician with no expertise in economics or finance, don’t give interviews. More detailed analysis from the Eurostat on reclassification of the Irish deficit is available now. The link to the document is here. Go into Ireland file, spreadsheet for 2009. "In normal circumstances, under the National Pensions Reserve Fund Act, an amount equivalent to 1% of GNP (about €1.5bn) is paid by the Exchequer into the NPRF every year, in 12 equal monthly instalments. In May 2009, the total due to be paid under this arrangement for the remainder of 2009 and 2010 was paid in one tranche, in order to allow NPRF to fund the bank equity purchase entirely from liquid assets. (The actual 'extra' amount paid at this time was some €2.5bn, given the amount already paid or due to be paid under the normal Exchequer- NPRF funding arrangement.) The impact on Government D4_pay in 2009 is therefore the cost of borrowing this extra €2.5bn earlier than it would otherwise have to have been borrowed..."
The Government has by-passed voted-in Budgetary procedures to inject €2.5 billion in additional funding into Anglo by front-loading future NPRF funds into 2009 provision. There was no Dail vote on this. The Government pretended that the additional 2010 funds injected were not borrowed for under General Government Balance, thereby de facto claiming a right to transfer future expected receipts into 'liquid' current receipts. There was never any Dail vote to allow for this, as far as I know. This is not the only time that the Government exceeded its remit in by-passing the Dail vote in relation to recapitalizations. One can argue that the entire Anglo recapitalization was planned and committed in advance of the Dail vote on the issue. "7. Special purpose entities included here are those where government has a significant role, including a guarantee, but which are classified outside the general government sector (see the Eurostat Decision and accompanying guidance note for details). Their liabilities are recorded outside the general government sector (as contingent liabilities of general government)." Per table 2 in the same spreadsheet, the above does not cover the Guarantees which amount to over €281 billion in 2009 (line 5). And in fact, these refer to Nama. Now, notice that 'imputations relating to the financing costs should be included' in line 4, which does count as a full General Government liability. Guess where the euribor cost of Nama bonds should be entered? Thus, Irish deficit might also include the 1.25%-odd payments to the banks from Nama bonds, or, assuming €35 billion issuance of these bonds - €437.5 million in additional deficit not accounted for in the Budget 2010. Now, recall that in 2007 euribor has reached well over 4%. Suppose we go to a 3-3.5% euribor pricing on Nama bonds, rolled over annually. In subsequent years, if Eurostat retains this classification of liabilities, up to €1,225 million will be added to our deficits courtesy of Nama. Breaking news: Eurostat just revised Irish General Government Deficit figures from 11.7% officially reported in Budget 2010 to a whooping 14.3%, raising our deficit above revised Greek figure. Here is the link to the note. Excerpt: "Ireland had its budget deficit revised even more [than Greece] -- to 14.3 percent from the initially reported 11.7 percent. Irish Finance Minister Brian Lenihan said this was a result of a technical reclassification associated with government support provided to the banking sector. "It is important to note that the underlying 2009 general government deficit for Ireland is 11.8 percent of GDP, which is broadly similar to that projected in December's budget," he said. "There is no additional borrowing associated with this technical reclassification. This is a once-off impact, and will not affect the government's stated budgetary aim of reducing the deficit to below 3 percent of GDP by 2014," Lenihan said." That would be putting a brave face on what now amounts to the most deficit-ridden country in the EU! One question remains to be answered - given that all 2009 recapitalization funds for banking sector came from NPRF, what 'technical reclassification' yielded this massive upward revision? Update: There has been a lot of talk in the blogosphere about the 'silver lining' to today's news. In particular, one argument is making rounds that goes as follows: "Since our deficit has increased for 2009 to 14.3%, then the reduction to 10.6% envisioned in the Budget 2010 will be even more impressive to the markets". Today's revision of deficit for 2009 represents a reflection by Eurostat that cash injected into the Anglo Irish Bank by the state was borrowed via general spending fund in the open markets and as the result constitutes deficit financing. If so, where do you think this year's banks recapitalization will come from? Uncle Sam? or may be Angela Merkel? These recapitalizations are not, repeat not factored in the Government Budgetary projections per Budget 2010. The Eurostat rulling means that should the Government borrow the €10-12 billion to recapitalize the banks in the markets this year, this too will be reflected in our deficit. 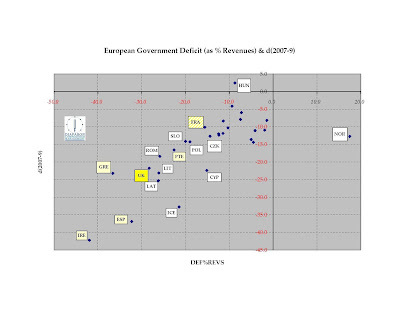 Now do the math - Government budget allows for €18.7 billion in General Government Deficit or 11.6% of GDP in 2010. If we add to this the lower bound of recapitalization estimates, our deficit rises to over €28 billion or a whooping 17.4% of GDP. Even if the Government wrestles out of the NPRF more cash to plug the banks balancesheet black hole, and assuming that our borrowing for banks purposes goes up by just half of the announced requirement, our Gen Gov Deficit will reach 14.7% of GDP. At which point we can all shout 'Eat our shorts, Greece!' once again. Today's revision clearly shows that the Government has been caught red-handed in attempting to avoid labeling our true General Government liabilities as such. This is about as reputation-destroying as Greece's use of financial derivatives in the past. An argument of a 'silver lining' assumes that as a one-off increase, this deficit revision does not matter going forward. This, in effect, is equivalent to saying that no cyclical deficit matters, no matter how big it is. Of course, such an argument is absolutely devoid of any anchoring in finance or economics. Cyclical deficits add up to total deficits. Total deficits - cyclical or not - add up to the total debt. This is exactly how Greece got itself into the bin! Per latest leaks from the financial regulators: In order to allow credit unions greater flexibility in re-scheduling loans, Section 35 of the Credit Union Act 1997 is amended to increase the proportion of the loan book of individual credit unions comprising loans of greater than five years duration, subject to appropriate liquidity provision and accounting transparency. This, in effect, is the plan for de-shoring up capital reserves at the Credit Unions, which so far have the lowest level of financial transparency in operations amongst all financial institutions licensed to conduct retail business in the country. Whatever hides underneath that iceberg, one can only wonder. However, it is now clear that our regulators are concerned with the unions' ability to re-negotiate non-performing loans and to, thereby, avoid calling in loans on ordinary households. Credit unions under this provision will be allowed to extend loans maturity, providing relief to the households who cannot repay their debts. However, unless householders' problems leading to delinquency on loans are temporary and short-term in nature, this measure will simply dig a deeper debt hole for already financially distressed families. And the news have implications for the banks. Recall that in theory credit unions should have been the most conservative lenders in the nation. If they are now experiencing significant pressures on their consumer loans, what can be said about the banks who hold jumbo mortgages, top-up mortgages and car loans leveraged up to 6-8 times peak 2007 income? How long can this charade last? IMF's GFSR report for Q1 2010 is out today, and makes a fantastic, albeit technical reading of the global financial system health. Ireland features prominently. Between October 2008 and March 2009, Ireland's contribution to cross-Euro contagion was 12.3% of the total Euro area distress probability - second highest after Austria (16.7%). For the period of October 2009 - February 2010, the picture changed. Greece came in first in terms of distress contagion risk - at 21.4%, Portugal second with 18.0%. Ireland's role declined to 8.1% - placing us 6th in the list of the worst contagion risk countries. A positive achievement, beyond any doubt. 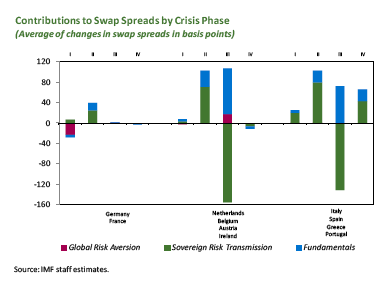 But again, IMF attributes the entire probability of the risk of contagion from Ireland to the Euro zone down to domestic fundamentals, not external crisis conditions. 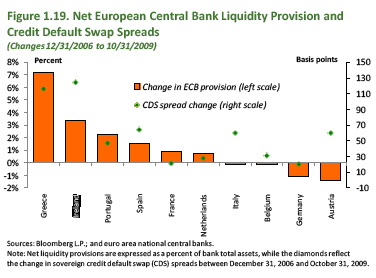 Notice that Ireland's term structure of CDS rates has barely changed in Q4 2009-Q1 2010. Why is that so? 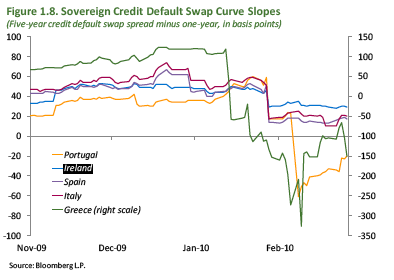 Despite the Budget 2010 being unveiled in between, the markets still perceive the probability of Ireland defaulting on sovereign debt in 5 years times relative to 1 year from now as pretty much unchanged. This would suggest that the markets do not buy into the Government promise to deliver a significantly (dramatically and radically) improved debt and deficit positions by 2015! In other words, the Budget 2010 has not swayed the markets away from their previous position, leaving Ireland CDS's term structure curve much less improved than that of the other PIIGS. Here is another nice piece of evidence. Guess who's been hoovering up ECB lending? The chart above, of course, covers 2008 - the year when Anglo posted spectacular results and AIB raised dividend. Imagine what this would look like if we are to update the figure to today. 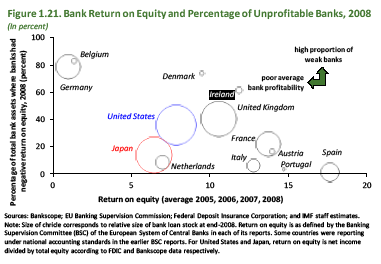 Also notice that in terms of return on equity, Irish banks were doing just fine with low margins back in 2008 and before. The reason for this is that our lending model allowed for that anomaly: banks were literally sucking out tens of billions of Euro area cheap interbank loans and hosing down a tiny economy with cash. As long as the boom went on, it didn't matter whether the bankers actually had any idea why and to whom they were lending. Now, the tide has gone out, and guess who's been swimming naked? Interesting note on the equity markets. looking at historic P/E ratios, the IMF staff concludes that back in February 2010 "For advanced economies, equity valuations are within historical norms". Except for Ireland, which deserves its own note: "Forward-looking price-to-earnings ratios of Ireland appear elevated due largely to sharp downward revisions in earnings projections." So, read this carefully: Irish stocks were overvalued - based on forecast forward P/Es - back in the time of the paper preparation. Using z-scores (deviation of the latest measure from either the historical average or the forward forecast based on IMF model) for Irish equities are: +2.1 for shorter horizon (a simplified 96% chance of a downward correction) and +0.9 for longer term forecasts (roughly 63% chance of downward adjustment). In other words, the market is overpriced both in the short term and in the long run. Worse than that, we have the highest short and long term horizon over pricing in the world! In housing markets, our price/rent ratio z-score is +1.1 (74% probability of deterioration), which means we are somewhat close to the bottoming out but are not quite there. How big is the 'somewhat' the IMF wont tell, but it looks like we are still 1.1 standard deviations above the equilibrium price. Price to income ratio - the affordability metric is at +0.8 stdevs, so prices might still have to fall further to catch up with fallen incomes (57% probability). INBS has reported a €2.49bn loss for FY 2009 on the loan book just under €11bn, with roughly €8.5bn of this attributable to development and investment in property markets. Provisions amounted to €2.8bn, so in other words, the Kingdom of Irish Local Finance has managed to pile up an impressive 25.5% impairment charge on the book that has already taken a hit in 2008. Between 2008 and 2009, INBS has managed to post impairments of 30%. The numbers are truly outstanding by all possible measures. INBS's administration expenses rose to €46mln from €45mln in 2008, and the bank has managed to accumulate €7 million in professional fees as one-off expenses, presumably relating to the management efforts to shore up the hull of a sinking boat. Per Irish Times report, CEO Gerry McGinn said the greatest management challenges were in relation to the commercial loan portfolio. "The society has manifestly been seriously under-resourced in many areas of its business activities and support functions, but most especially in commercial lending," he siad. Under-resourced? As if throwing more cash at staff and consultants would have prevented them from issuing so absurdly poorly priced and analyzed loans? At this stage, especially given Mr McGinn's denial of the reality (that the INBS is a burnt-out force with not a modicum of decorum to pretend that it can act as a functional lender) any more taxpayers cash directed to the INBS would be a pure and gratuitous waste! Last week, media report (Silicon Republic, 16/04/10, 300 out of 1,900 former Dell workers received FAS training) provided some evidence that was supposed to show us just how effective Fas training systems can be. "The Steering Committee responsible for advising on the implementation of the European Globalisation Adjustment Fund (EGF) for the 1,900 former Dell workers in Limerick has revealed that 300 have received FAS training so far... The committee ...is chaired by Oliver Egan, assistant director general in FAS. Another meeting is scheduled for towards the end of this month." So hold on - so far, we know, there were meetings. And more meetings will happen. "The Minister for Labour Affairs, Dara Calleary TD, commented: “There is a lot which has been done already and is being done with EGF support in the mid-west and which is perhaps only now starting to become visible”." The commencement of a dedicated EGF internship programme in partnership with the medical devices sector which will see more than 80 clients attending a series of workshops in April with successful candidates progressing into the full internship programme in June 2010 [This is perhaps the closest that Fas would ever come to giving these workers real hope of a gainful employment]. So, over 6 months after the layoffs, there are absolutely no hard numbers Minister Calleary can supply to show any success in progressing the former Dell workers into gainful employment. Surely, this is disturbing, given that Fas work does not come cheap and given that Minister has managed to set up a score of various schemes and taskforces - none of which are free to the taxpayers. "I have committed to reviewing the overall programme in June to ensure that we are maximising the reach of the programme and to identify any additional or innovative measures that might be further considered,” Mr Calleary said. Really? So far, there are no indications that the review is going to be effective in assessing Fas' effectiveness in designing, administering and deploying these programmes. My own take on the same topic was published here. Third, the political pressure rising against the Euro in Germany. Hell, by these metrics, we are already in the midst of the euro collapse by 2 out of three measures (first and third). Alas, the second metric is a bogus one. There is plenty of evidence to show that ECB has not been an 'inflation hawk', acting often pro-cyclically before and targeting the likes of PMIs instead of hard inflation and monetary parameters. So the real question here is: What's the potential trigger for an exit? Exit now, saving the aforementioned money, but destroying its political capital within the EU. The problem is that the net cost of (1) is much smaller than the net cost of (2). And this means there has to be another - non-Greek - trigger. Italy or Spain? So, as I have predicted in the interview with BBC World Service (excerpt here), the markets have little faith in the Greeks and, indeed, in the EU’s ability to effectively underwrite Greek crisis. Greek bond yields are now rising again on the investors’ view that German, French and Irish legislators might veto the deal. And in Germany there is a growing movement to challenge the Greek deal in a constitutional court, as being an illegal subsidy. The yield on Greek two-year bonds jumped 66bps yesterday reaching 6.99% and 5-year CDS rose 56bps to 436bps. And FT’s Daniel Gros argues that the EU package is unlikely to solve anything, as the country needs about €30-50bn annually, depending on the future deficits path assumptions. Either way, 3-year package of up to €45bn won’t cut it. And the interest bill savings are also too thin – under the EU proposed deal, Greece will be facing an interest rate of ca 5%, which will provide the country with only €900mln in annual savings relative to market rates. Going lower to 4% - something opposed by Germany – will raise savings to ca €1,350 million per annum – still short of what is needed. Per Gros: the Greek problem is not one of liquidity but of insolvency. And the IMF is severely constrained in what it can do in Greece by the fact that it can only lend 10-12 times the reserves position that Greece holds with IMF. And this means, at a maximum €15 billion. So here we go – for all who thought the story is over, the most likely thing is that the actual story is just beginning. 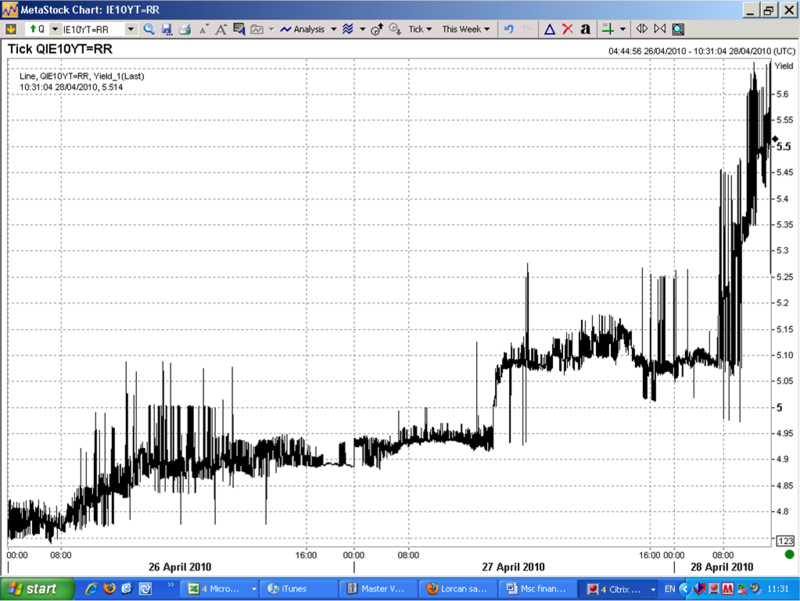 Economics 13/04/2010: As bad as Northern Rock back in 2008? So we have some more clarity on the state of our credit flows, courtesy of the latest monthly report from the Central Bank. And boy are we sick. At the height of the financial crisis, Northern Rock had 303% loans to deposits ratio. Ireland Inc? 269% absent risk adjustments on short-term deposits, and 323% once short term deposits risk of call-in is set at 10%. Ouch! Irish financial system doesn’t resemble Quinn Insurance – it resembles Anglo! 2010, "expect GNP to be essentially unchanged from its 2009 volume; the corresponding figure for GDP is ½ per cent less than in 2009". 2011, "expect GNP to grow by 2¾ per cent and GDP to grow by 2½ per cent. While this return to growth is to be welcomed, it should be seen as a modest pace of growth." 2011 figures would be above my forecasts of 1.7-1.9% GNP, 2.0-2.2% GDP. "In spite of the stability in the numbers employed, we expect unemployment to fall between 2010 and 2011, averaging 13¾ per cent in 2010 and 13 per cent in 2011. This expected fall in the rate of unemployment is related in part to expected migratory outflows – 60,000 in the year ending April 2010 and 40,000 in the year ending April 2011. We also expect to see on-going falls in labour force participation." My view - if we are to have 60K outward migrants in 2010, what would hold the others back in 2011? There will be no prospects for new employment (and ESRI agree) and there will be improved jobs offers abroad (IMF agrees), so why not 80K in 2011 to follow 60K outflowing in 2010? "In our analysis, we assume that the Government will implement its indicated budgetary package for 2011 where spending cuts and tax increases will amount to €3 billion. When combined with a return to modest growth and the consequent impact on revenues, we expect to see the General Government Deficit falling to 10¾ per cent of GDP in 2011, down from 12 per cent in 2010." Putting aside the issue of whether this Government has ability to implement planned cuts, 10.75% deficit in 2011 certainly implies that there is no chance of Ireland meeting its obligations to reduce deficit to below 3% of GDP by 2014. "We note that the recapitalisation needs of the Irish banks are now likely to be at least €33 billion, assuming that the State investment in Anglo Irish Bank ultimately amounts to €22 billion. In terms of net cost to the State, a figure of €25 billion is possible." Great, folks, €22-27 billion was my estimate of the eventual cost of Nama produced back in the H1 2009. ESRI finally converged to this forecast of mine. Good to note. My current article on the longer term prospects for global economy, published in the current issue of Business & Finance magazine. This is an unedited version. Forget the circus of the Euro zone Government’s bickering about Greece’s bailout package and the escapist idea of setting up the EU-own EMF. The real crisis in the Euroland is now quietly unfolding behind he scenes. Finally, after nearly 15 years of denial, courtesy of the severe pain inflicted by the bonds markets, Brussels and the core member states are forced to face the music of their own making. The current crisis affecting Euro area economy is, in the end, the outcome of a severely unbalanced economic development model that rests on the assumption that exports-led economic expansions in some countries can be financed through a continued massive build up in financial liabilities by their importing partners. Put more simply, the problem for the world going forward is that in order to sustain this economic Ponzi game, net importers must continue to finance their purchases of goods and services from net exporters by issuing new debt. The debt that eventually settles in the accounts of the net exporters. One does not have to be versed in the fine arts of macroeconomics to see that something is wrong with this picture. And one does not have to be a forecasting genius to understand that after some 40 years of rising debts on the balance sheet of importing nations, the game is finally up. I wrote for years about the sick nature of the EU economy - aggregate and individual countries alike. Last week, Lombard Street Research's Charles Dumas offered yet another clear x-ray of of the problem. Lessons and Policy Implications from the Global Financial Crisis; Stijn Claessens, Giovanni Dell’Ariccia, Deniz Igan, and Luc Laeven; IMF Working Paper 10/44; February 1, 2010hare of global financial debt during this crisis courtesy of an out-of-control public expenditure and the lack of private sector deleveraging. Take an alternative look at the same data. 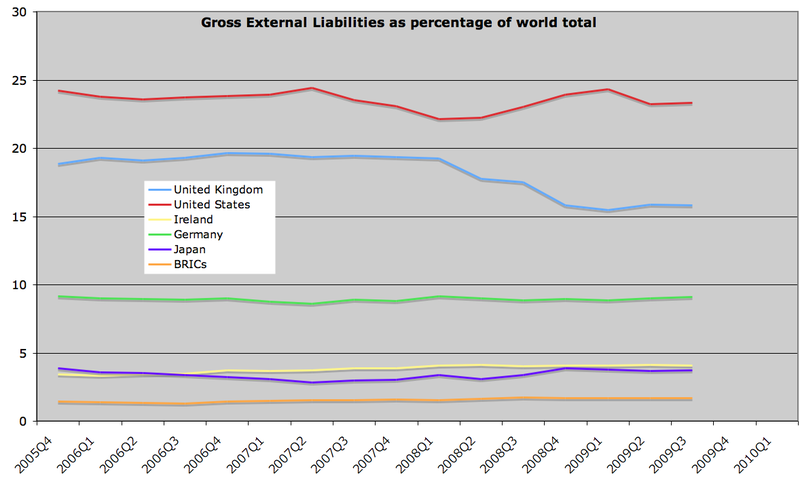 Ireland’s gross external debt (liabilities) stood at a whooping USD 2.397 trillion in Q3 2009, up 10.8% on Q3 2007. Of these, roughly 45% accrue to the domestic economy (ex-IFSC), implying that Irish debt mountain stands at around USD 1.1 trillion or more than 6 times the amount of our annual national income. Chart below shows gross external debt of a number of countries as a share of the world’s total debt mountain. And this brings us to the singularly most unfavourable forecast this column has ever made in its 7 years-long history. Far from showing the signs of abating, the global crisis is now appearing to be at or near a new acceleration point. Given the long-running and deepening imbalances between growth-less net exporting states, like Germany, Japan and Italy and the net importers, like the US, we are now facing a distinct possibility of a worldwide economic depression, triggered by massive debt build up worldwide. No amount of competitive devaluations and cost deflation will get us out of this quagmire. And neither a Social Economy, nor Knowledge Economics are of any help here. Paraphraisng Cypher in the original MatrixLessons and Policy Implications from the Global Financial Crisis; Stijn Claessens, Giovanni Dell’Ariccia, Deniz Igan, and Luc Laeven; IMF Working Paper 10/44; February 1, 2010: “It means fasten your seat belt, Dorothy, ‘cause Kansas of debt-financed global trade flows is going bye-bye”. Economics 1/04/2010: Travel time? Not a chance.